Last month T and I campervanned around the South Island. Here’s Part 1 if you missed it. Today: from Queenstown through to Wanaka, and toward the West Coast via Mt Aspiring way. Seeing as I’d recently visited Q-town and loved it, I was super excited to show T around. The lake town didn’t disappoint, nor did the famous Fergburger (though the famous PJs Fish and Chips didn’t quite live up to the hype; good fish, disappointing chips). That was a Saturday night. I’m sure Queenstown nightlife is hard to beat, but neither of us are drinkers or partiers, so we retired to our house on wheels and prepared for the following day on the snow. I wanted to try skiing, and booked myself an all-inclusive beginner package for The Remarkables ranges (we chose it over Coronet Peak because T got fixated on the various terrain zones mentioned in the brochure we picked up at the info centre. Good choice too, because the Ozone tubing park kept us entertained for the duration of a ride down the slides). T stuck with snowboarding so we kitted him out in town (Green Toad had excellent prices) while I had to get in line at the mountain to pick up my gear, then gather with fellow noobs for a lesson. This is surely as close to heaven on earth as it gets – 360 degrees worth of nothing but snowy white peaks and clouds as far as the eye can see in every direction (look beyond the carpark below…). I will say this: the Remarkables road is harrowing. We were stuck behind a shuttle bus for most of it – the driver made signs to let us overtake near the start, then apparently changed his mind and soldiered on for many more kilometres. It’s unpaved the whole way, and of course, narrow and winding. It was slow going, but we made it, and it was so warm and so dry snow chains didn’t even factor into the equation. As for skiing vs snowboarding? I’m torn. Snowboarding was easy to get started with. Skiing took a little more getting used to. But with snowboarding, I didn’t usually have problems getting up (aside from sheer weakness). With skiing, you’ve got to contend with your feet sliding out in crazy directions, and if I fell down on a gradient, I simply could not get myself back up successfully. I pretty much had to walk down to somewhere with more even ground. Very frustrating. Skiing was definitely convenient in that it’s so easy to get around even if you’re not on a downhill slope, though. Queenstown, like Milford, is targeted at expensive tourist activities that will part you and your dollars quickly. It’s the de facto home of adrenaline junkies (skydiving! snowshoeing! jetboating! bungy jumping! mountain biking!). And of course, while the snow season is shorter than in some other countries, it’s still a huge draw. Aside from skiing, the one other thing I originally wanted to do – badly – was ride the Skyline gondola. The entrance was even right around the corner from the holiday park we stayed at. But I had to question whether the views would really be anything special, particularly when you add up tickets for two people (and cost caused me to rule out going for the dining option entirely). The other cheaper option might have been to walk up then ride it down, but T wasn’t keen, and wouldn’t have had anything to occupy himself for the time that would take if I did it alone, so I cut that from the itinerary and cut the strings on my FOMO. While we were at Milford Lodge, an Australian man struck up a chat with me in the (unisex) bathroom. I explained our rough itinerary, leading to this outburst from him: “Wanaka! You have to go to Wanaka!” I assured him we had no intention of missing Wanaka on the way north, and indeed, it blessed us with a lovely day. T had been eyeing up a clay shooting excursion in Queenstown, one so exclusive its location is secret, and trips well in excess of $100 per person. But while at Adventure Park in Cardrona, I picked up a brochure and found just what we needed: a place offering 20 rounds for a mere $35. The sole guy who greeted us at Have A Shot in Wanaka told T the average hit rate in clay shooting is four out of 20. He made six. 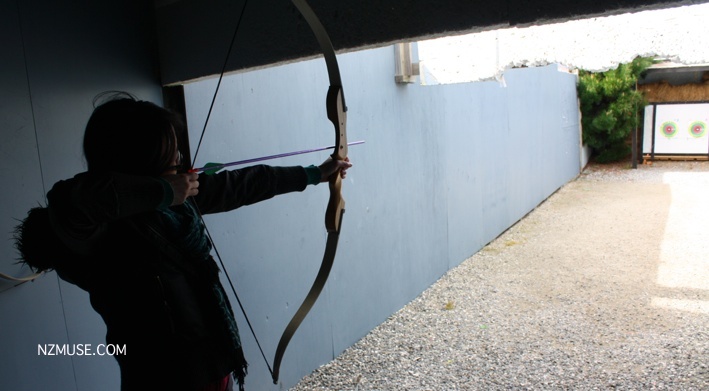 We both had a go at archery and the rifle range, then popped across the road to the Toy and Transport Museum ($12 each). From old fire engines and classic cars to entire Barbie, Star Wars and Action Man collections, it’s seriously impressive, and the stuffed toys they leave inside many of the vehicles are a nice touch. From Wanaka we set out toward Mt Aspiring National Park, following the road sign – but actually ended up going the wrong way, fairly deep in the wrong direction in fact, which we realised when we hit a tiny gravel road. But it was a fun detour and we stumbled across Hospital Flat, a rock-climbing haven T loved. GPS switched on, we got back on track – all the way back to Wanaka itself and onto the correct highway that winds along the east border of the park, as planned. About halfway (the park is enormous) through we started to worry about petrol; that earlier detour hadn’t done us any favours. By the time we reached our goal – the Haast Pass – and managed to find a reasonably removed corner off the road to stay for the night, I had horrible visions about running dry in the middle of nowhere and waiting days to be found. With that fear still in mind, we rose the next day, drove a little further and stopped at Thunder Creek falls. I’d been wanting to walk in the park, and there are lot of short trails toward the Haast end of Mt Aspiring national park. Thunder Creek was a gem – just a few minutes to the end, where we were rewarded with gushing pure streams, a waterfall and the most delectable rocks I’d ever seen. I realise that’s a very strange way to put it, but I am a sucker for amazing natural textures, and these rocks had it going on. BEHOLD. T made it about halfway across the water, with an eye to reaching the waterfall. Mid-morning, we chugged into Haast, with fuel to spare – the empty light wasn’t even on. Whew.